Its hard to know where to start because there are so many things about Graeme Obree that make him the perfect hero - so much so, that it has not passed Hollywood by. Even so, he still deserves the "unsung" because, the chances are, that you haven't heard of him before. Graeme Obree is your true cycling fanatic. Growing up in Scotland he competed in local time trials and supported his family with the proceeds from a humble cycle shop. He became entranced by the holy grail of competitive cycling - not the Tour de France but the hour record - which consists of cycling as far as you can in one hour. It is a record that has been held by the likes of Miguel Indurain and Eddie Merckx and is supposed to be about as close as you can get to legalised torture. Now I am a bit of a purist when it comes to sport. For example, what I dislike about staged events like the Tour is that there are tactics, there is etiquette and prizes are given for hanging on the back wheel of someone only to sprint the last 30 seconds to be the first to cross one of the arbitrary stage finish lines. 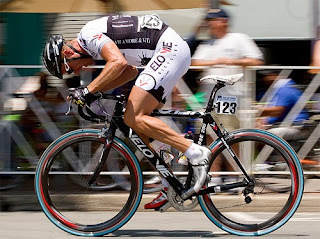 Consider the Ironman - there is no drafting allowed (the significant aerodynamical benefit of hanging on the back wheel) and no prizes for those who have the fastest bike leg and the sponsorship deals play second fiddle to the event itself. What makes Graeme the ultimate cycling purist is not just the unquestionable brutal reality of the one hour record but the fact that he raced on a bike he built and designed himself! In fact, it is just possible that triathlon has Mr Obree to thank for the invention of the aerobars and the aero-position, but we'll come to that in a minute. Obree was in many ways the antithesis of Chris Boardman, the technical cyclist who trained with pulse meters, knew where his lactate threshold was and, more importantly, had the best bike sponsorship money could buy. This is not to detract from Boardman who was an incredible athlete but rather to put Obree's achievements in context. In 1993, Obree booked the velodrome in Norway for 24 hours so that he could attempt his record; he failed by nearly a kilometer. Incredibly, he came back the next day just an hour before his booking ran out and went for the record a second time. Imagine the pain his muscles must have been in even before starting! And even more incredibly, this time he managed to secure the hour record! A week later, Chris Boardman who, to be fair, had already announced his intentions of breaking the hour record some time before, stole the record from Obree. What was worse was that the UCI (Union Cyclisme Internationale) decided that Obree's riding position was "illegal". 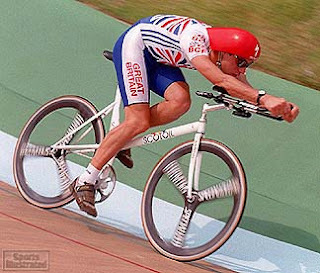 Obree had invented a peculiar riding style (see picture) in which he tucked his arms under his body, like a ski jumper, for maximum aerodynamic efficiency (and minimum comfort, no doubt). It's true that it was a fairly dangerous way of riding as Obree himself demonstrated when he lost control of the bike - but it is always better to make rules proactively before they are broken rather than reactively. This didn't stop Obree, oh no. He invented another riding position, perhaps inspired by a film he had seen. Da dadadada, da da da! The UCI also banned this position and came up with some apparently arbitrary ruling based on the position of his seat. Nevertheless, Obree took back the hour record in 1994, gaining not only a sporting victory but a moral one. It seems like the UCI has learned its lesson and now states that the hour record must be completed on a bicycle similar to the one Merckx used in 1972. I have to say, I am in favour of this. Being a purist as I have said, I'd rather the winner was decided on the track and not in the laboratory or the work bench. Obree showed that, in spite of there being virtually no limits to the technology employed in the bike, even an amateur stood a chance (for the ball bearings in the bottom bracket he used some from his washing machine). However, nearly 20 years later with wind tunnel fashioned carbon fibre frames I'm not sure it would still be the case. I think that the sport of rowing has the balance right on this issue: any innovation which would price a significant part of the competition out of the market was banned. The most famous example of this is the ingenious idea of the sliding rigger with which Chris Ballieu beat Steve Redgrave to victory at Henley: instead of 100kg athletes thundering up and down the boat on sliding seats, why not allow the pivot point (rigger) to move instead? These boats still exist but are not allowed in any competition. There is also a minimum weight a boat can have thus putting a stop to the fierce search for ever lighter, stiffer (and more expensive) materials. In cycling, the rules are terribly confusing and complicated - it depends very much on the competition. Obree not only fought his battles on the track: as a sufferer of bipolar disorder, he was prone to devastating bouts of depression. He has tried to commit suicide (thankfully with no success) at least three times. Last thing I heard is that he is writing a book on dealing with depression to follow up his excellent and thoroughly recommended autobiography "The Flying Scotsman". I also heard that he was planning to attempt the hour record again as recently as late last year. I think it is just as well that he didn't and, to me, shows me that he is winning that harder and more vital battle with himself. On a side note, I can't help noticing how cycling and depression seem to be intimately linked. I suspect that the missing link is the word "obsession". Every year, it seems, another professional cyclist commits suicide (I've read that 3 of the 60 Tour de France winners have committed suicide which is a very abnormal proportion). Then there is Chad Gerlach, an American professional cyclist and past team mate of Lance Armstrong who has spent stints between competitions as a homeless crack addict. Although there is a big motivational difference between taking crack and human growth hormone, say, perhaps there is a reason in all this why cycling is the sport most often linked to drug offenses. POSTDATA: Wow, this post has suddenly become the most visited post on my blog - maybe it will go "viral", hahaha. Perhaps he is not so unsung after all and more people are singing about Obree than I realized. It could also be connected to the "news" I read recently that he has said that he is gay. First of all, I'm not really sure it is any of our business (and why is this usually described as an "open admission" as if it were something to be guilty about?). Secondly, in the context of his struggles with bipolar disorder and world level competition this can only have been an extra stress. Hats off to you Mr Obree. I'm not surprised the post went 'viral' or that Obree will eventually get his due. From different views, different stars emerge. I came of age post Merckx, in the Hinault-Fignon pre Lemond phase. I sought to admire Lemond after him and Boyer joined in to the European circuit, but he paled in comparison to the pinache of Hinault, the class of Fignon, or the power of the legends like Moser. He was whiny despite his efforts and we lacked a champion. At the same time, on track were the names like Nelson Vails who were heroes to me too. But the recent echoes of the Moser record were resonating in Winning magazine and Bicycling ( the only sources for info for a Texas kid). As two years Lances' senior, I enjoyed different heroes. 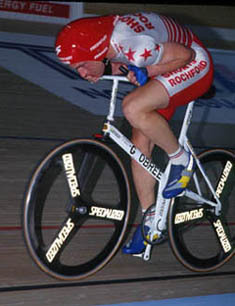 Obree's name never emerged. Because of the lack of coverage, his story would be lost over here in many ways. But....I'm a Scot by blood and love. I was looking around for some Scottish movies to enjoy and Flying Scotsman was on. In our home, that's a no-brainer. This film is very personal, not simply because of his record, the great scottish backdrop but...cycling is often a lonely art of OCD athletes who have a different vision that makes all of this much more exciting. Obree is truly a Hero in the classical sense of the word. He struggles against an unseen force that is a vision. He fails yet rises again to try while never losing sight of this vision. These are not small feats and it is not surprising to me that he struggles with bipolar disorder or other such areas of stress. This level of athlete, though coming from 'average stock' are not average in their level of concentration. Obree (not the movie version) is a real flesh and blood example of the extreme nature of our sport. Thanks for your great post. I appreciate that someone takes the time to fill in these 'blind spots' for our busy lives. Thanks, Chris, very interesting comment, I appreciate it.